This past Wednesday Apple had a keynote event announcing the iPad 2. Steve Jobs demonstrated the refined new iPad in a highly polished presentation while simultaneously slipping in a few jabs at Apple’s competitors. Overall it was a pretty standard affair for an Apple event. As I listened to Steve speak, one phrase kept gnawing at me. Steve said that the iPad was “a post-pc device”. As an iOS developer who makes his living building apps for iPads and iPhones, I disagree. 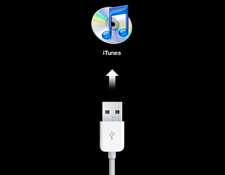 You see iOS has this ball and chain attached to it called “iTunes” that runs on a typical PC. The first time you turn your iPad on you’re greeted with this screen on the right prompting you to plug your iPad into a computer so it can be setup. You can’t even turn your iPad on the first time without being tethered to iTunes. Do you want to get media on your device (other than from the iTunes store)? Better have a computer handy so you can sync with iTunes. If you’re traveling and must preform a hard reset (where you lose all of your data) what do you do? You won’t have any way to get your data back until you get home and can sync your latest backup from iTunes. As someone who no longer travels with a laptop (just an iPad), this thought terrifies me. For a device that is “a post-pc device”, it sure feels like a peripheral product to a typical computer. I love my iPad and my iPhone but to call them post-pc devices is pure ideology at this stage in the game, and not grounded in reality. With Apple’s massive data center rumored to go live anytime, they could alleviate a lot of these problems by letting some of your data reside in the cloud. Until then as an iOS developer, I believe calling the iPad a “post-pc” device is disingenuous. Well said! Honestly, until that day comes when Tablets allow seamless editing of spreadsheets and presentations, the Tablet will simply be an additional device and not a replacement for the PC/Laptop.